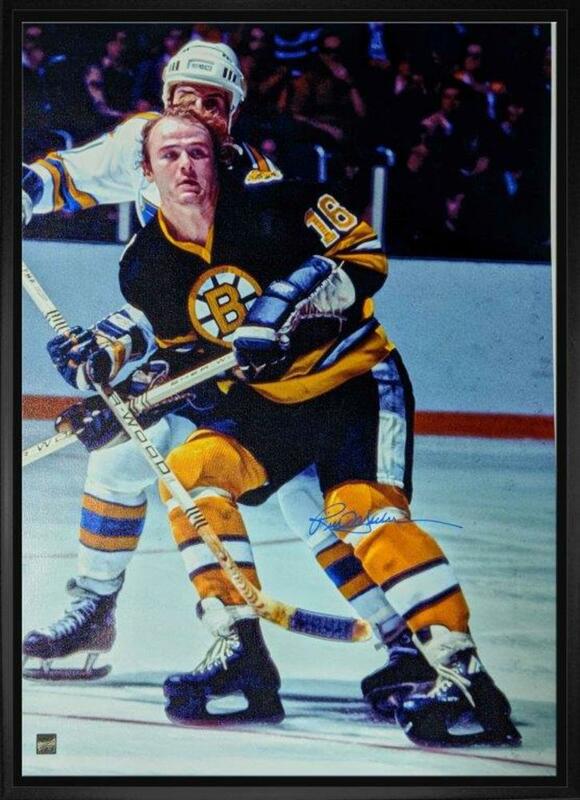 This canvas was personally signed by 14th overall draft pick in 1973, Rick "Nifty" Middleton. Middleton played 14 years in the NHL, two years with the Rangers, and twelve with Boston, where he made a name for himself. Middleton currently ranks #2 in career shooting percentage (19.7) among players with 400+ goals. Middleton holds multiple NHL records such as, most points in one playoff series (19) and most assists in one playoff series (14). Middleton was forced to retire after struggling with a concussion in the 1986 season. Middleton managed to complete one more full season and retired after the 1988 season. The image has been printed on to high quality art canvas and is professionally stretched and mounted on the back of a 3/4" deep wooden frame. A Frameworth hologram and certificate of authenticity are included to ensure the legitimacy of the signature. Frameworth is an official licensee of the NHL & NHLPA. Frame Size: 22x31".